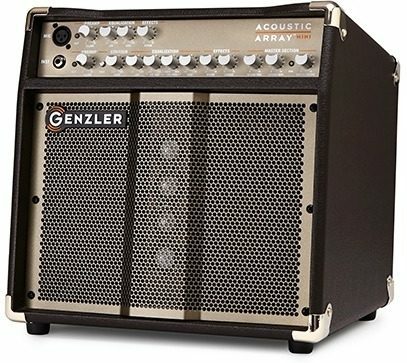 The Genzler AA-MINI offers a full featured preamp design with dedicated mic and instrument channels, a unique Contour circuit (Inst Ch), flexible EQ network, Digital Effects, a 100-Watt Class D power amplifier platform, unique angled cabinet shape, and a sophisticated speaker system design. The focal point of this lightweight, compact combo is a speaker system engineered for acoustic instrument reproduction that is based upon a revolutionary Bass Array format from Genzler's bass guitar cabinet designs. The AA-MINI speaker system features a specialized 8" woofer in a ported chamber along with the performance and pattern control of a proprietary line array column, which is mounted forward of the woofer in the center of the speaker baffle. This line array column utilizes 4 custom designed 1.5" neodymium soft dome drivers. The use and placement of the line array provides exceptional clarity and ultra-smooth response, along with broad dispersion and projection that line array principals provide. The custom 8" woofer delivers tight, punch and roundness for the lows and lower mids, while the upper mids and high frequencies are produced by the line array and are clear, natural and authentic to the acoustic instrument. The blend of this innovative speaker system along with Genzler's preamp and amplifier platform delivers an acoustic amp like no other available. At 21 lbs., the Acoustic Array MINI is a versatile package ideal for a variety of instruments and venues. - Preamp: Dedicated Mic and Instrument Channels. - Inst. Input: 5Meg ohm input impedance. - Channel Volume: Voiced to provide natural, pristine, transparent reproduction of the instrument. - Input Phase switch: Reverses the polarity of the instrument input to help control potential feedback. - Contour: Continuously variable control of a pre-shaped curve that boosts lows and highs while simultaneously cutting Mids. The slope is fairly gentle which keeps the tone shaping very musical. This curve covers a wide range of EQ and offers a quick and simple starting point for EQ adjustments. - Active Equalization: The AA-MINI's Instrument channel contains an active 3 band equalizer with a sweepable parametric mid-range frequency control. - Digital Effect: The Mic channel has its own REVERB level control and the Instrument channel offers both REVERB and CHORUS controls that provide the user with the most flexibility. The parameters of each effect are variable at the Master Section with the Reverb Time and Chorus Rate controls. - Power Amp: The Acoustic Array MINI uses a state of the art, Class D power amplifier design and a high frequency auto-sensing universal switch-mode power supply (SMPS) to achieve unprecedented high performance in a lightweight package. For global use, there are no Voltage Switches to change or jumpers to move. This SMPS senses the line voltage from 100-240 Volts and automatically configures itself.